"Broken Play" will be an infrequent, irregular, hopefully not incoherent series of posts laying out the case for a reboot to the league and national playoff structures of university football. 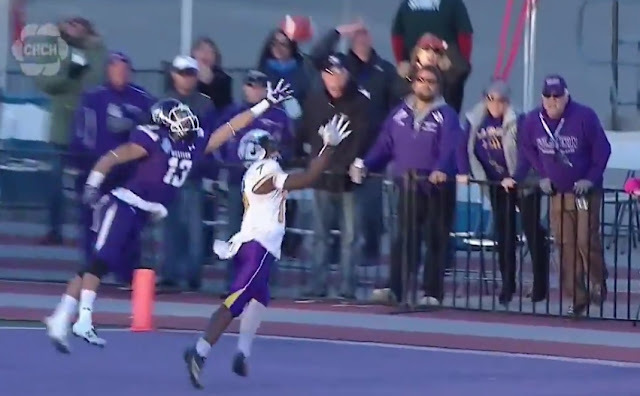 Today, part 1 looks at the Western Mustangs' dominance within Ontario University Athletics, at least before Halloween. Western isn't just controlling the line of scrimmage, it obliterates it — and we have the receipts. First and foremost, the glass-half-full take with the current pecking order of OUA is that the league is in a good position for such time when the national brand for university sports, self-proclaimed, institutes an expanded Vanier Cup championship with wild cards and an extra tier or two of playoffs. The latter could happen in 2020, '21, or whenever Toronto actually begins building a new subway line; that Uteck Bowl beatdown last November certainly seems like a tipping point. The Mustangs are head and shoulders above everyone else, but there are a number of teams with potential to be a credible second team out of Ontario, and maybe even a third. It could be Laurier. It could be McMaster. Carleton and Ottawa each seem to be on the upswing and tradition never graduates at Queen's. That's the good news. The bad news is that, yes, there is a competitive imbalance in the conference. Western doesn't appear to be challenged. You probably knew that already since the Mustangs, since the kickoff to the 2015 season, are 31-3 in reg-season and playoffs in Ontario. In the service of getting our daily requirement of haterade, let's relive those losses. 2016 Yates Cup: Laurier wins 43-40 after a 24-point rally in the final 11 minutes. What were the odds the Golden Hawks would convert four third downs, with 8.25 average yards to go, in the late stages of a road game? 2016, Week 2: Carleton hangs on for 38-31 home win. The Mustangs actually came all the way back from being down 24-0 to lead by seven in the fourth quarter. But Carleton fifth-year senior quarterback Jesse Mills essayed consecutive touchdown drives to retake the lead, With Stevenson Bone in at quarterback since Chris Merchant wasn't fully integrated into his new offense, Western went on a 15-play drive in the final three minutes, but was halted three yards short of the tying touchdown when Cedric Joseph was stopped on an inside-zone run on third-and-6 with 39 seconds left. If a Merchant with a full grasp of the offence had been available, Western probably isn't running the ball up the gut on third-and-6. 2015 Yates Cup: Guelph won 23-17 after running the Mustangs out of rocks. Western needed to go 80 yards in the final 89 seconds to score a converted touchdown and win, but it could only navigate 70 before Nick Parisotto and the Gryphons defence latched the door. So three losses in 3½ seasons, and one involved a collapse / comeback for the ages and two involved the narrowest of escapes by opposing defences that were as bendy as a Republican senator's ethics, but ultimately didn't break. One can hear the status quo knee-jerking: see, anything can happen ... on any given day. That argument is also brought forth after the bloodlettings such as the 2017 Uteck Bowl, or during the regular season, when scores such as 67-7, 74-3 and 76-3 pop up as they have the last two weeks. For those wincing at home, or at the office, those scorelines were from Western-Waterloo in what was nominally a first-place matchup, Montréal against Concordia — it was 3-3 after the first quarter! — and Western-York. Point being, cherry-picking scores doesn't move the ball down the field in any direction. The best way to ask the question is to go to the stats, and this is where I know my limit; I got into sportswriting before it required a math degree. Large sets of datas are elusive to me as clever metaphors and similes. But I can look at one table of sports stats and do the Captain Copy-and-Paste into another spreadsheets. So Western claims seven of the top eight spots on the list, with only Peak Kyle Quinlan McMaster and Carleton from the season when its first recruiting class were all fourth-years getting into the top 11. There are several strands once can pull out of this hay pile, but the big one is that the top half of the chart runneth over with Western teams. The only one not in the top 11 is the 2011 iteration, which only ended up going 7-1 and hosting the Yates Cup game, which it lost to McMaster and Quinlan. The other takeaway is that no other side from 2017 graced the list and it's unlikely another 2018 squad will as well. (Waterloo and Tre Ford are putting up 500 yards a game, but they're also giving up about 500, too.) That speaks well for the internal competition once you take Western out of the equation. But there is no second place, really, until wild cards for the Vanier Cup championship come into being. Everyone can draw their own conclusion, but hopefully this buttresses the case for the OUA embracing meaningful non-conference play. The league isn't a challenge for Western most weeks. The traditional model is certainly past peak and offering something new might help stimulate interest. It's not hard to put the conference in a context where mainstream sports are constantly reformatting in an effort to draw eyeballs; there are certainly pertinent examples from golf and motorsports about getting away from the tried-and-true and repackaging. Perception is reality, and the impression of being a one-team league is a drawback to selling casual fans OUA needs to root locally on Saturday afternoons. In future posts, the focus will be on how to sell a more collective approach to university football, as well as a somewhat radical realignment idea for OUA and RSEQ.